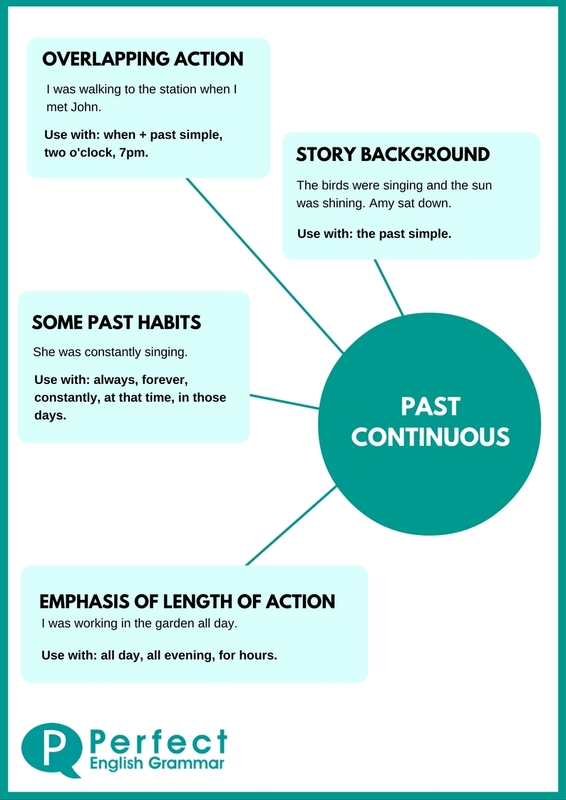 Read about how to make the past continuous here. 1: An action in the past which overlaps another action or a time. The action in the past continuous starts before and often continues after the other shorter action or time. 2: In the same way, we can use the past continuous for the background of a story. (We often use the past simple for the actions.) This is really a specific example of Use 1. The birds were singing, the sun was shining and in the cafés people were laughing and chatting. Amy sat down and took out her phone. 3: Temporary habits or habits that happen more often than we expect in the past. We often use 'always', 'constantly' or 'forever' here. This is the same as the way we use the present continuous for habits, but the habit started and finished in the past. This thing doesn't happen now. He was always leaving the tap running. 4: To emphasise that something lasted for a while. This use is often optional and we usually use it with time expressions like 'all day' or 'all evening' or 'for hours'. I was working in the garden all day. He was reading all evening. Remember you can't use this tense or any continuous tense with stative verbs. Try some exercises about the past continuous here.